POLITICAL TIDBITS: President Noynoy should not act like a thug toward the SC, but practice more statesmanship. Reversal by anyone of the 13 magistrates who voted unanimously vs. DAP would be suicidal for them, considering people’s current anger. Fort Sto. Domingo encounter between Janet Napoles and bishops---mixture of pathos, anxious fear and fatherly advice to tell the entire truth. President Noynoy should not act like a thug toward the SC, but practice more statesmanship. Reversal by anyone of the 13 magistrates who voted unanimously vs. DAP would be suicidal for them, considering people’s current anger. Fort Sto. Domingo encounter between Janet Napoles and bishops---mixture of pathos, anxious fear and fatherly advice to tell the entire truth. After the President’s address to the nation last Monday evening on the Disbursement Acceleration Program (DAP) and how its nearly P200 billion funds were allegedly used, a major TV-radio network perceived as pro-P-Noy took an impromptu survey of people’s sentiments toward P-Noy’s address in a low-income area in Manila. The commentators were aghast that an overwhelming majority of interviewees was quite angry and hostile to P-Noy. This negative reaction appears to be shared by many people around the country, judging from various comments, and it is good to analyze just why this fierce negative outcry against P-Noy and DAP. First of all, people are angry that P-Noy should be so combative toward the Supreme Court---the first President to react this way. He should realize that though we citizens do quarrel with SC decisions at times (and call magistrates names privately) we do not want this institution bullied and vilified. The President is expected to be the first to uphold respect for the Court and the Rule of Law, and to exhibit more statesmanlike behavior. Despite its questionable record at times, the SC for many citizens remains the last bastion of freedom and defender of the Constitution. But not only was P-Noy publicly disrespectful toward the justices, he also let loose his allied thugs in the House, to seek to repeal the Judicial Development Fund that was installed by the Constitution to protect judicial independence (so the magistrates don’t have to run to Congress all the time). The House thugs also began rattling the impeachment saber at them. Then too, like the obedient doggie in the window, COA under the leadership of SC aspirant Grace Pulido Tan announced that it’s looking into the justices’ earnings and the Court’s budget. But worst of all, a truly peeved P-Noy asserted that in the possible clash between two departments, a third one could be summoned to intervene. Pundits are now asking if that threat could mean military intervention. The phrase 'Palace coup' whereby the President could remain installed by grace of the armed forces has been buzzing among political pundits since Monday evening. P-Noy’s combative stance comes at a time when many things are not going right. He has been over-protective about his allies, misreading public sentiment against DAP’s architect, DBM Secretary Butch Abad---even as P-Noy’s agencies are totally preoccupied against the political opposition. This has prompted Batanes Bishop Camilo Gregorio, Abad's prelate, to question the administration's selective justice at the bishops' Club Filipino press conference following their visit to Janet Napoles..
People blame P-Noy for the high prices of basic commodities, crowded trains, horrendous traffic and now even Glenda’s fury. But wait till experts scrutinize the DAP list and see how many billions upon billions went to inane expenditures and obvious cross-border transfer of funds that the SC shot down. Pundits have opined that all these could trigger a revolution. P-Noy should abandon his announced intention to file a motion for reconsideration of the DAP decision--a thinly veiled effort perhaps to bamboozle some magistrates to do a turnabout. The way citizens have reacted to his combative stance, however, it’s easy to see that NOT ONE of those 13 justices who voted DAP unconstitutional would dare do a somersault---if they value their reputation and career. Plain folks are angry and Palace stooges should abandon wearing yellow ribbons on their shirts, as P-Noy has asked them to--- especially in market-places or in bus and train stations, unless they’re ready for fist-fights. Not advisable too, to use yellow stickers in their cars. By the way, instead of yellow, court employees all over the country will wear black this Monday, in protest against the assault on the SC. A reprise of the Corona trial days. The story of the bishops’ meeting with Janet Napoles in her Sta. Rosa, Laguna detention center began toward the third week of last month, when she sent a signed letter to the “Mindanaon Bishops” through Archbishop Romulo T. de la Cruz of the Archdiocese of Zamboanga, who had earlier visited her in her hospital room at the Ospital ng Makati. Napoles said “I decided to tell the truth, though it hurts, regarding the controversies on the alleged abuse/misuse of PDAF, Malampaya, DOTC Funds and the like.” As a Mindanaoan, she said she is seeking the Archbishop’s “guidance and protection as I face these trials.” She had asked to see De la Cruz as he had known her family, the Lims, way back in Basilan where he had been bishop for 13 years. He also came to know Janet’s husband, Jimmy Napoles, when he was transferred to the diocese of Kidapawan, North Cotabato where he stayed for 26 years. After receipt of her letter and affidavit, however, Bishop de la Cruz had to leave for Rome. Last June 29, Feast of Saints Peter and Paul, he and Bishop Marlo Peralta of the Archdiocese of Nueva Segovia in Vigan were among 22 bishops from various parts of the world to be raised to Archbishop by Pope Francis. The installation of an archbishop is a beautiful and solemn ceremony where the candidate personally receives from the Pope the “palium,” a wide collar extending up to the waist and fashioned out of sheep-skin. Prior to installation each individual palium is made to rest overnight on the tomb of St. Peter in the imposing Basilica, and it symbolizes the transfer of authority from Peter to the new archbishop. Early last week, Archbishop De la Cruz, fresh from Rome (and as his brother bishops teased him, his halo still shining) told his colleagues about Napoles’ petition for prayers and guidance in tackling the need for truth--- and her plea for Church custody. 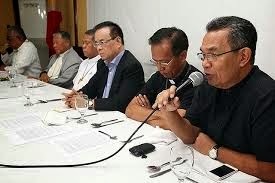 The bishops had just wound up their two day semi-annual conference and when the matter of custody was raised there, CBCP President Socrates Villegas announced that this would not be possible. Archbishop De la Cruz, however, felt it was his pastoral duty to respond to Napoles’ letter and visit her in detention; several bishops wanted to come with him. Last Monday morning, Archbishop De la Cruz and Lipa Archbishop Ramon Arguelles (who momentarily forsook his hospital bed in Batangas, where had been confined for severe coughs and colds for some days), and Bishop Gregorio of Batanes journeyed to Fort Santo Domingo, and they were joined by two prominent Protestant prelates: Bishop Efraim Tendero, National Director of the Philippine Council of Evangelical Churches, and Pastor Art Corpuz of the United Church of Manila. The bishops found a very jittery prisoner Janet under double lock in her cell and in fact, all five visitors were locked up with her during the visit. The place was barbed all around, with only a curtain as rear wall---all of which, she admitted, made her quite frightened. Adding to the pathos was that the visitors saw her husband Jimmy Napoles standing across the road, but he was not allowed to enter as it was not visitation time for him. Frittering like a housewife and serving them coffee and cookies, eventually Janet began to relax and chatted with them in the next two hours. She narrated that “some people” told her that she should remove some names from her list but she didn't agree. Once reports spread that she would like to divulgel the entire truth, however, various harrassments allegedly came, e.g., some guards were withdrawn, leaving her more vulnerable. Janet told the clerics that the whole government is corrupt, to which Archbishop Arguelles replied that the more meaningful solution is to effect change of the whole system. At the press con later Arguelles spoke about the National Transformation Council that's being proposed as a substitute for the current leadership, and why systems change should not be made to wait until 2016. It's as in now, and this blogger agrees. Napoles was asked why she chose to say nothing in reply to queries about politicians guilty of investing in her fake NGOs during the Senate hearing some months back. She said this was because she got a call while on the witness stand, asking her to shut up, and at that point she had to comply with this mystery caller (who is this person?) as she was very worried for her children. She also felt the pressure from DOJ handlers to channel accusations of scams only to the opposition. Napoles told the bishops that a far bigger corruption was practiced by other operators not linked to her, (what Bobi Tiglao had referred to as the "non-Napoles operators?). Arguelles opined that P-Noy had seemed to have become super-dependent on DBM Chief Butch Abad that he cannot live without his Budget Chief. At the press conference the bishops held at Club Filipino upon their return from Fort Sto. Domingo, Arguelles explained that the Church is a sanctuary and anyone who comes under its fold ought to be protected, and that the State has the moral obligation as well to protect Napoles. Archbishop de la Cruz felt that she has more things to reveal and would be willing to tell the truth---if she could be assured of more protection. Bishop Tendero said he noticed that the charge sheet vs. Napoles included people of humble means, such as the nurse of her mother and the driver. He batted for full disclosure by the prisoner as well as accountability from all public officials. .Pastor Art Corpuz, on the other hand, noted that in fairness to Janet, she did not ask for any concession. Soon it was time for the visitors to leave, and thanking them for precious time spent with her, the prisoner began to cry anew at the pained parting.